Fight fires involving Nuclear Weapons. Carry out Fire Prevention of buildings. 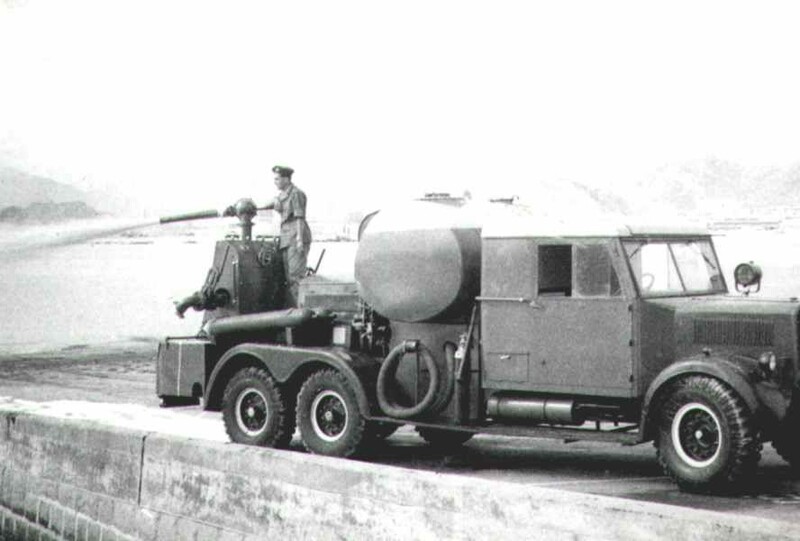 Provided fire cover to Nuclear Convoys on the UK roads. Provided fire cover to The Queens Flight. Deployment of emergency airfield lighting. Bird scaring.Recovery of aircraft engaging the Rotary Hydraulic Arrester Gear (RHAG). 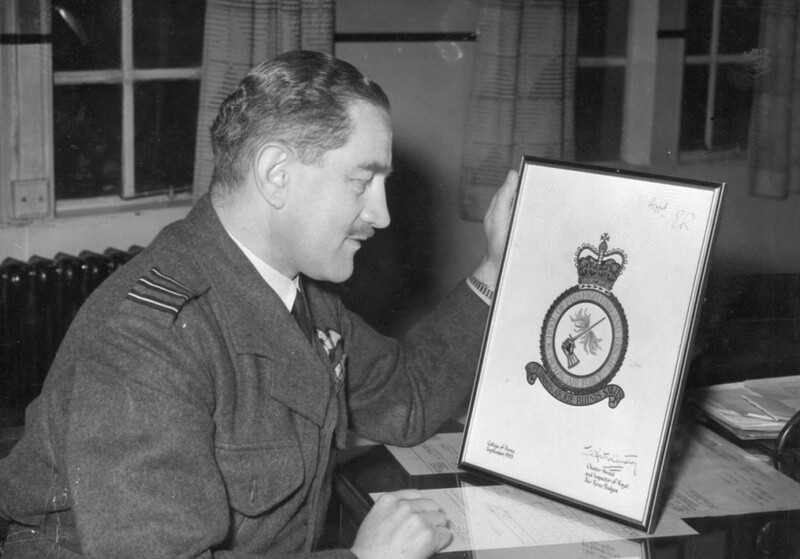 During their history RAF Firefighters have received many awards for acts of bravery, many of these were earned during WWII but many have been awarded in modern times. The awards include George Cross’s, George Medals, B.E.M.s and the highest was the Queens Gallantry Medal awarded in 2011 to Warrant Officer Steve Bowden for an incident in Afghanistan. To trace the roots of the RAF Fire Service it is necessary to go back to the early days of Military Aviation, and as aircraft became more complex so did the Fire Fighters job and the need for improved equipment to enable them to save lives. The RAF was officially formed on the 1st April 1918 and during its formative years the loss of aircraft and equipment due to fires caused a great deal of concern. These incidents can be said to have been the foundation stones of the present RAF Fire Service. 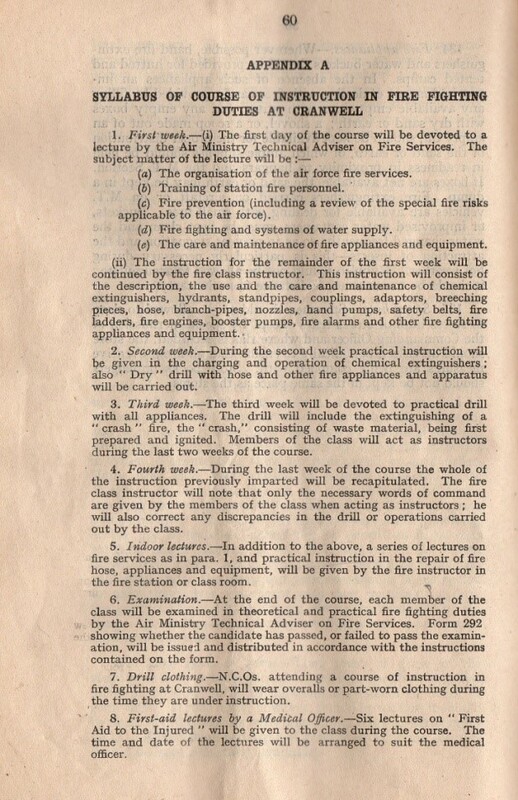 Although it must be remembered at this time, personnel tasked with fire-fighting were taken from different trades, with fire fighting a secondary task and this would be the status quo until 1943 when the Air Ministry promulgated an order creating the trade of Fireman which would be a full time occupation. 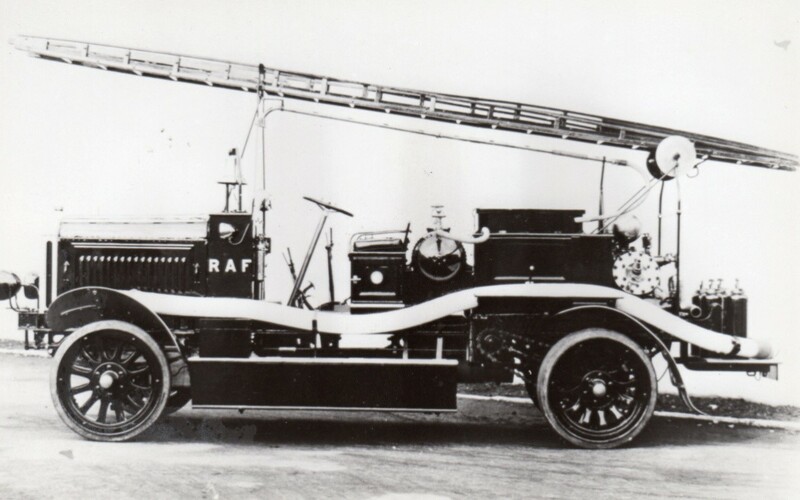 In 1918 fires at Shotwick and Ternhill cost £57,000 also losses of nearly £50,000 after fires at Wyton, Upavon and Lopcombe Manor compelled the Air Ministry to order a number of fire fighting vehicles with pumping facilities. Also a fire On May 21st 1919 at Ligescourt in France resulted in the loss of a Handley Page aircraft (0/400 D8314) and the hanger in which was accommodated. This fire was fought with only portable extinguishers, subsequently the Court of Inquiry concluded that the RAF lacked effective fire fighting equipment and that personnel were poorly trained. This eventually led to the provision of a fire vehicle at every permanent RAF Station. 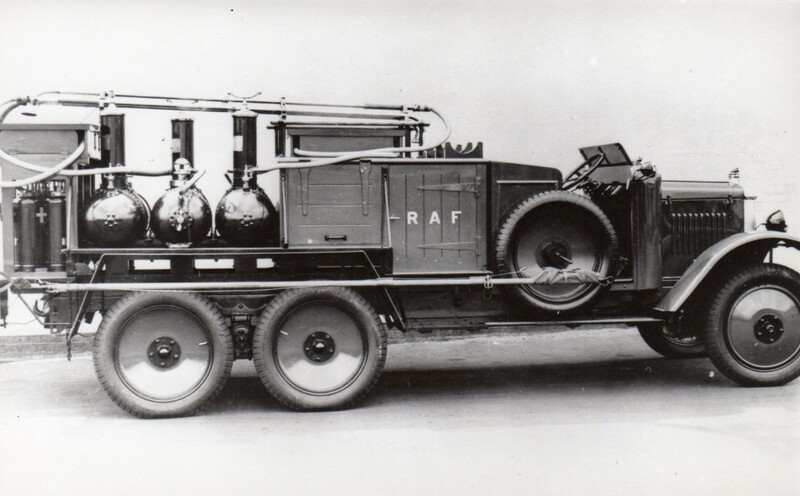 In 1921 Vehicles were initially adapted to the airfield role and modified Crossley 6X6 tenders were fitted with crash rescue equipment, a single 30 Gallon chemical foam extinguisher and ‘Fire Snow’ (Foam) hand held extinguishers. By 1922 the modification programme was complete. 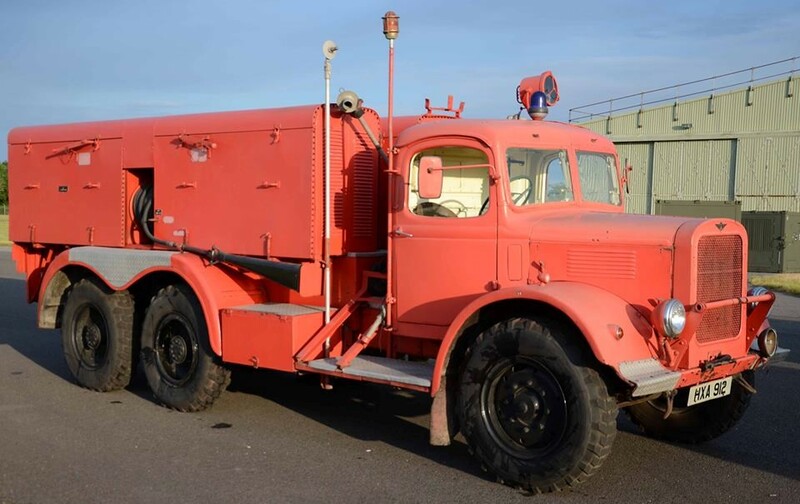 A rebuilt Crossley Crash tender at Duxford showing a single 30 gallon chemical extinguisher tank mounted behind the driver. 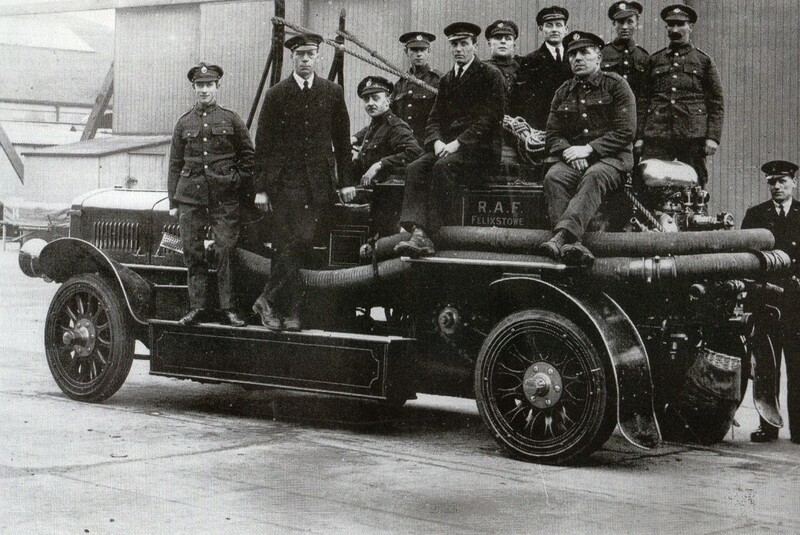 1922 The Fire Training of RAF personnel started at RAF Cranwell where a small unit was established to train a trade known as Aircraft Handler/Fire fighter. The London Fire Brigade controlled the Unit who provided the instructors and devised the training methods and schedules. The Chief Instructor of the unit was Captain Desbrough. 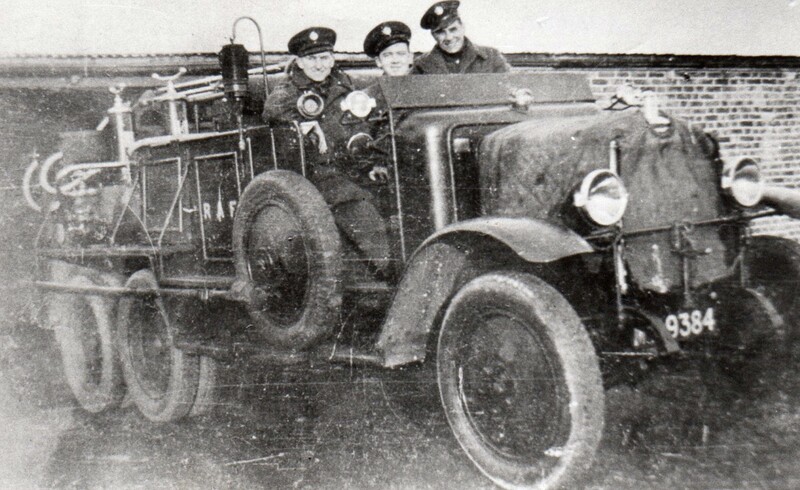 Very little is known of the activities and effectiveness of the unit at RAF Cranwell; however links remained with the London Fire Brigade well into the 1940’s. 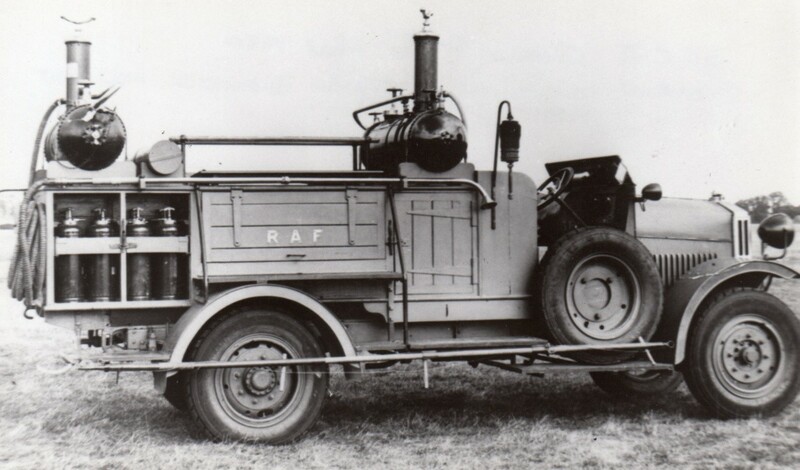 In 1930 the RAF ordered more Crossley and Morris B1 chassis for conversion to fire tenders. 1931 Morris Commercial 3 Foam Tanks and Wooden Body Work. 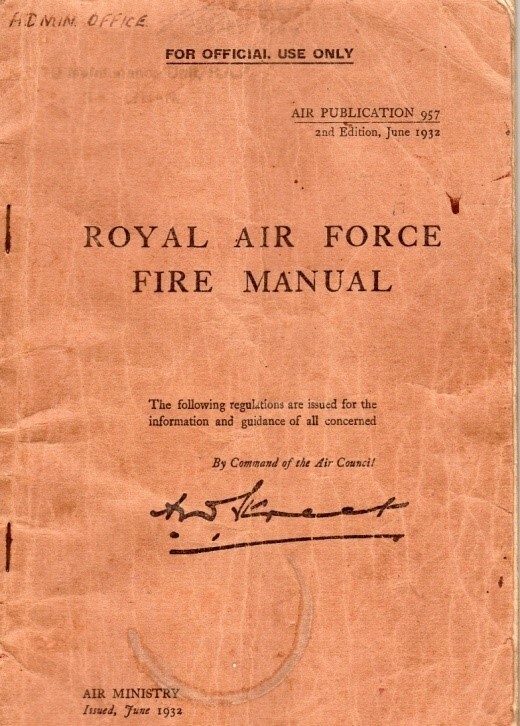 1932 The Air Ministry published an ‘Air Publication’ (AP) 957 entitled ‘ROYAL AIR FORCE FIRE MANUAL. Although it was a general fire fighting manual there is mentioned two early Fire Tenders and drills associated with these. 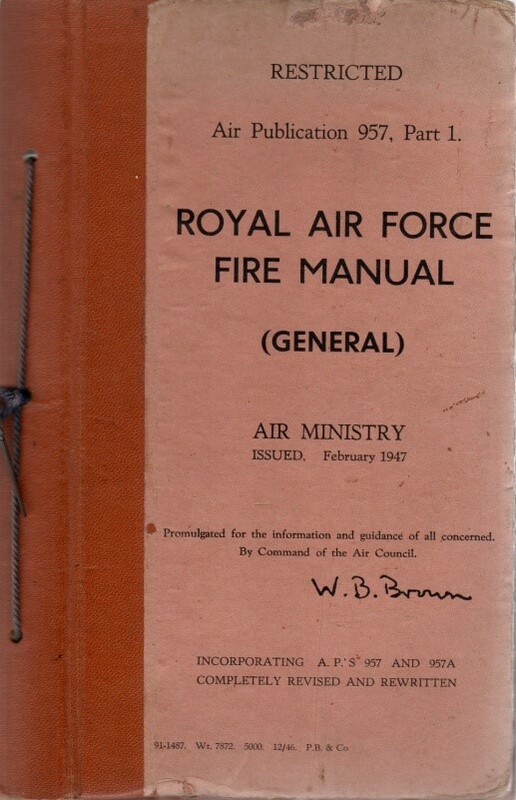 Also an appendix laying out the Syllabus for a Course of Instruction in Fire Fighting Duties at RAF Cranwell appears. Rear view showing the stretcher bay. 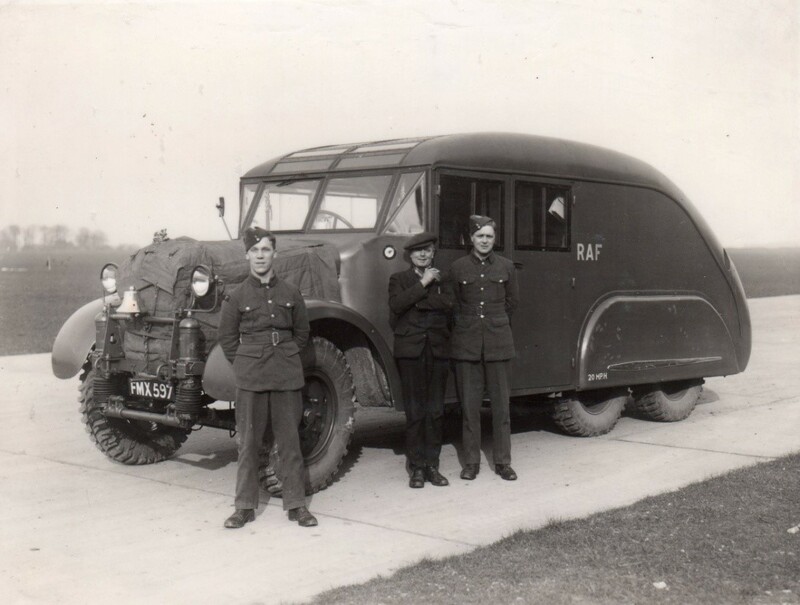 During This Decade (1930’s) The Crossley IGL (Indian Government Lorry) went into service with the RAF the first example of this in 1936 was the ‘Streamlined Crossley’ 6×4 which was also the first fire vehicle with bodywork enclosing the whole vehicle. 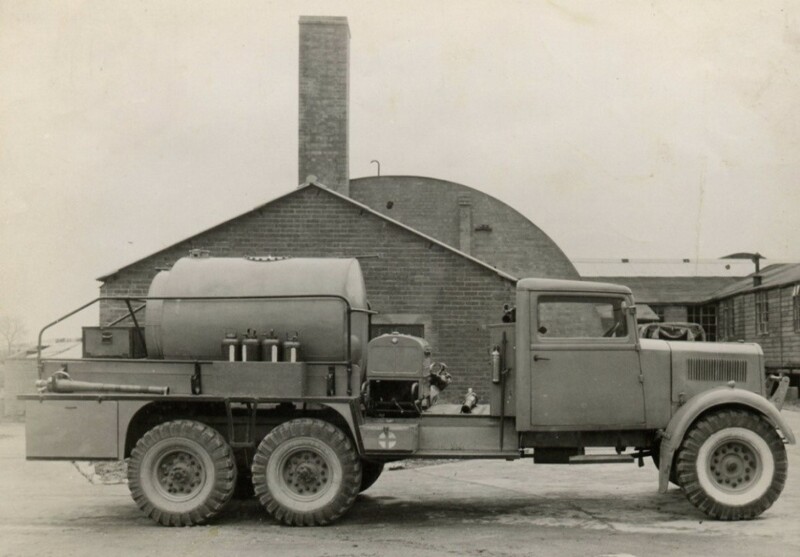 It was fitted with 200 gallon water tank and 20 gallons of foam compound were available for foam production and discharge by twin air-foam pumps driven by a power take-off in the cab. It was also equipped with four 60Ib CO2 cylinders discharging through hosereels and applicators. 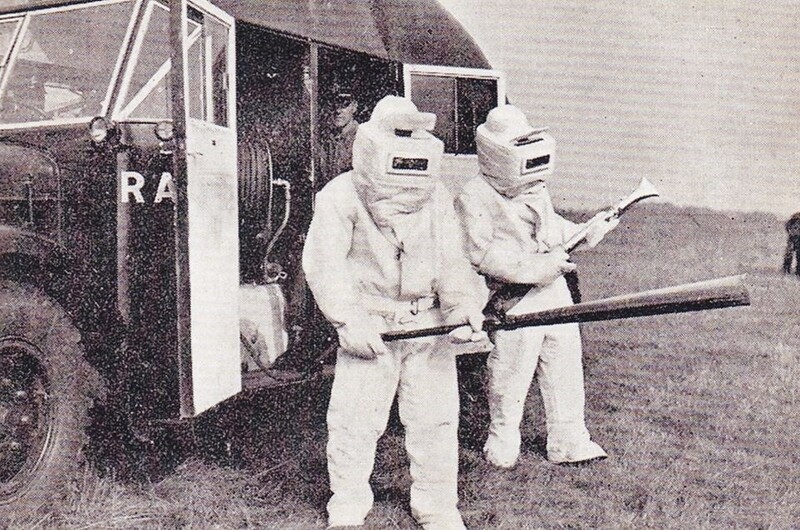 The streamlining was not an exercise in styling, but was designed to facilitate cleansing and decontamination after a gas attack. The streamlined tender and the one shown here was photographed at RAF SCAMPTON in 1936. 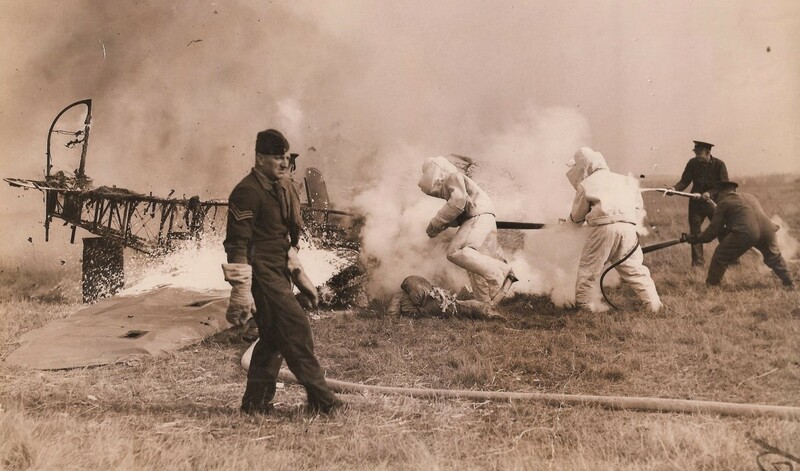 The first type of protective clothing which was introduced for fire-fighters was an asbestos suit manufactured by Bells Asbestos and Engineering Company. It weighed around 28lbs (12.7 Kg) it was only worn for close rescue work by maybe two fire-fighters. The image shows two fire-fighters close to a Streamline Crossley, one holding the CO2 line and one holding the foam line. But by 1943/44 the asbestos suit was seen to be too cumbersome for use with modern aircraft and was rendered obsolete. Many people would not associate the Royal Air Force Fire Service with boats. 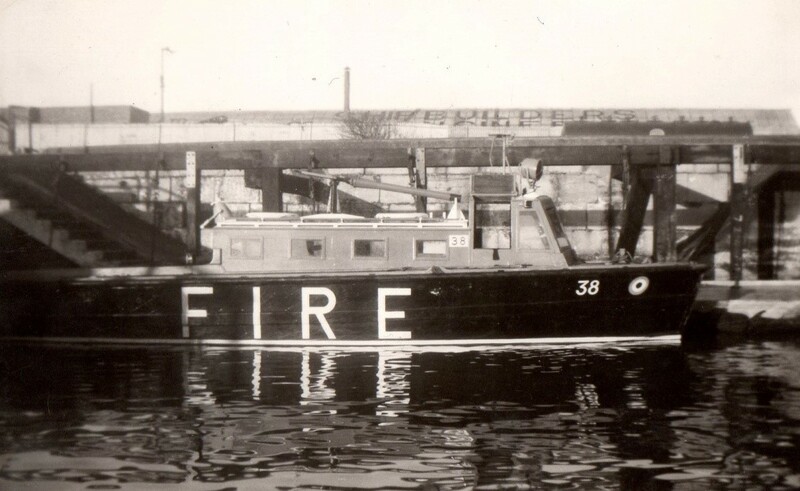 But in the late thirties early forties some seaplane tenders which were used for servicing RAF Flying Boats were converted to Fire Floats in order to reduce the risk of damage by fire in the seaplane while secured in the harbour out of reach of a normal fire tender and it would also be used to protect other installations. At first there were several conversion types, and ranged in length from 37.5 ft, 38ft and 40ft (11 to 12 mtrs) and were powered by either Meadows or Perkins engine. The conversion was improved and the Mk1a and MkIIa made an appearance. The water pumping unit for both conversion types was supplied by Coventry Climax and a 350/500 g.p.m. 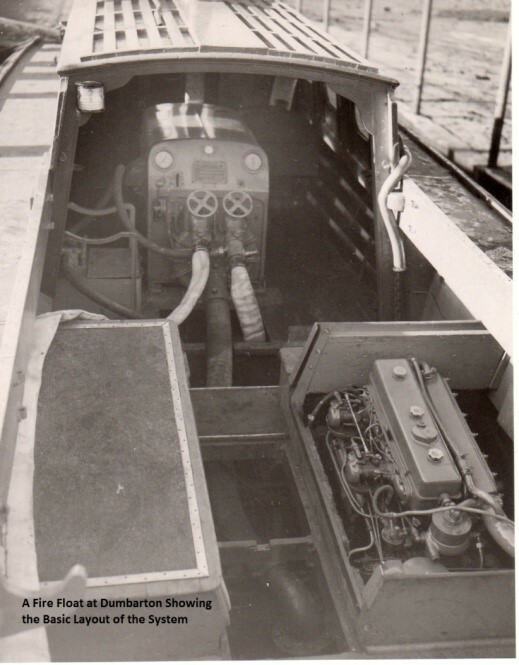 pump unit mounted on bearers within the cabin connected to a 5ft length of 4 inch suction hose coupled to a 5 inch sea inlet, A hand operated swivel type monitor was fixed to the cabin roof and fed by a short length of rubber lined hose from the starboard side pump delivery. Part of the port side cabin was cut away to accommodate a multi jet inductor with a 20 gallon foam compound tank. 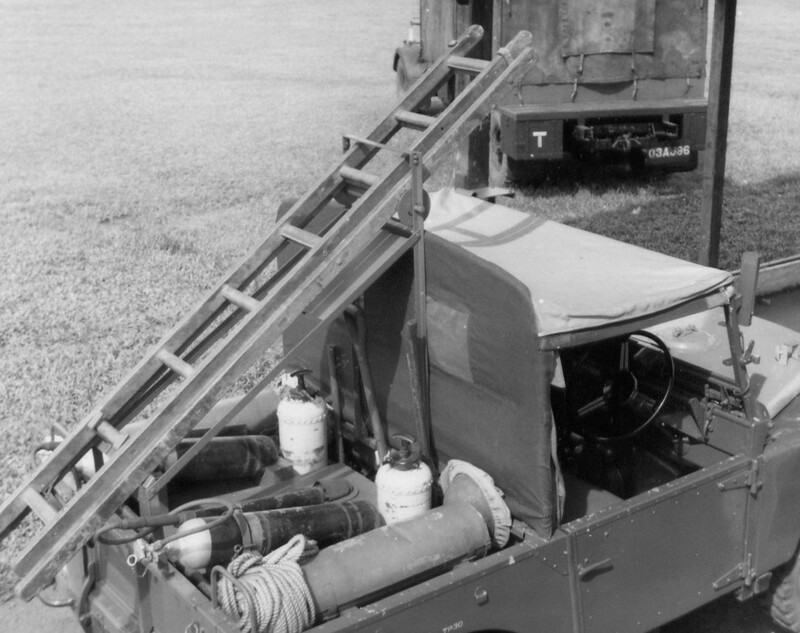 Shortened lengths of hose were used with No2 size foam producing branch pipes with a knapsack tank and two No10 branch pipes were also carried, one adapted for use with the monitor. The later modifications included two 50 gallon inter-connected foam tanks that were fitted in the bilges which allowed it to produce 2,700 g.p.m. of foam for 11 minutes. Alternatively, it could supply water only. The standard crew for a Conversion fire Float was five men, consisting of one coxswain, one engineer, one N.C.O. fire fighter and two fire fighters. 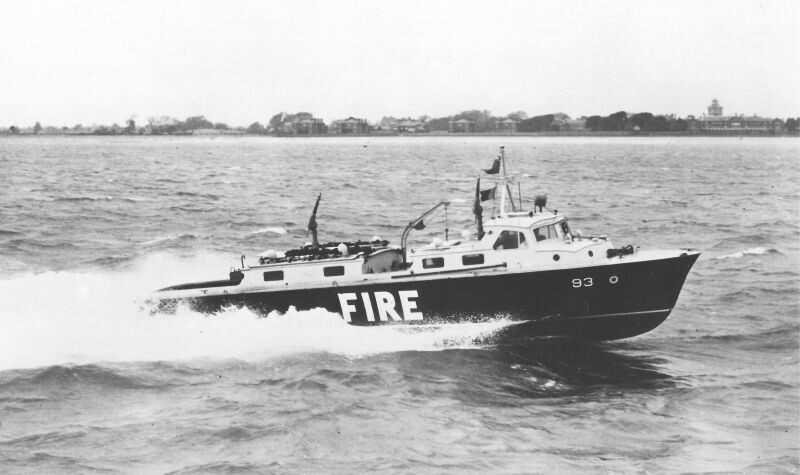 One Seaplane Tender ST206 which was converted to Fire Float 1 has connections to Aircraftsman Shaw (Lawrence of Arabia) his workbook shows that he was based at RAF Catfoss (Bridlington) and that he worked extensively on ST 206 before its conversion. 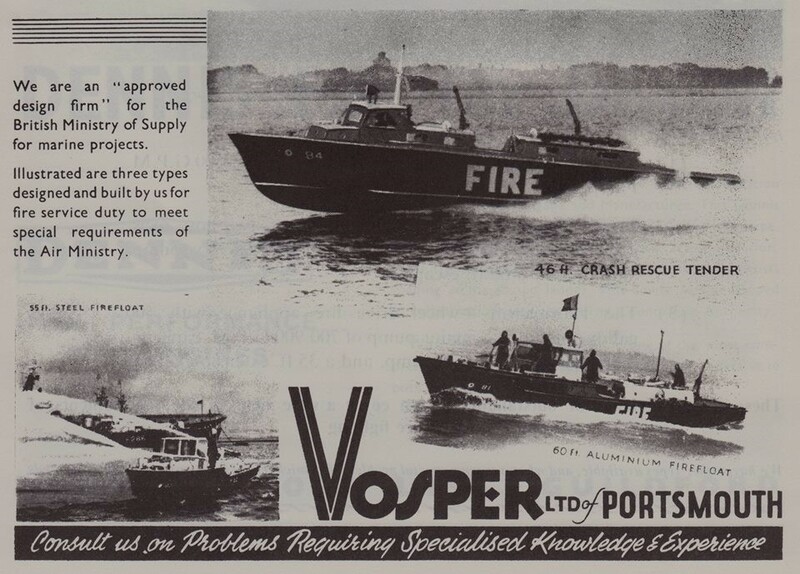 There were some purpose built fire floats built by Vosper Ltd of Portsmouth, 50ft and 60ft (15 to 18 mtrs) prototypes appeared but a 46ft (14mtrs) Mk2 won the day and two were produced carrying the designation FF93 and FF94. The pumping engine was a Ford V8 which drove a rotary vane pump manufactured by Sun Engineering Ltd and was designed to deliver 2,250 to 2,500 gallons of foam or 500 to 600 gallons of water. With the end of RAF Flying Boat operations in the late 1950’s brought the demise of the Fire Floats for the RAF Fire Service but the Service would venture again in the marine world in the 1960’s. 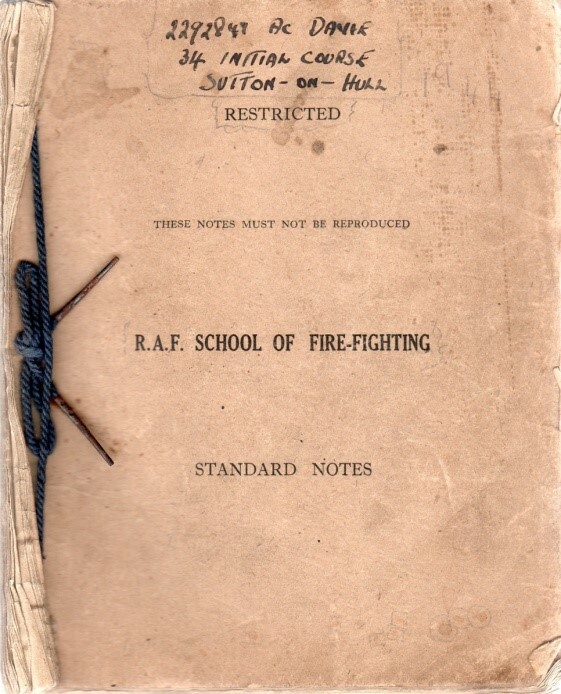 In July 1940 the Fire Training moved from RAF Cranwell to RAF Weeton but only for 3 years and in August 1943 moved to RAF Sutton on Hull. This was where the Fire Service was to see immense changes in its structure and organisation. The Training unit was to be known as the RAF School of Firefighting. The Air Ministry realised that there had to be significant changes made in the approach to aircraft fire fighting. This was mainly due to aircraft becoming larger with increased fuel loads which in turn required greater foam producing capacity from vehicles. Also the introduction of the jet aircraft brought on new challenges and this required improved firefighting techniques and more intense and specialised training of personnel. In the early hours of a day in September, 1941, this airman saw an aircraft having difficulty in landing at an aerodrome. Anticipating a crash, he took charge of the fire tender, although not officially on duty, and arrived at the scene of the accident within three minutes. 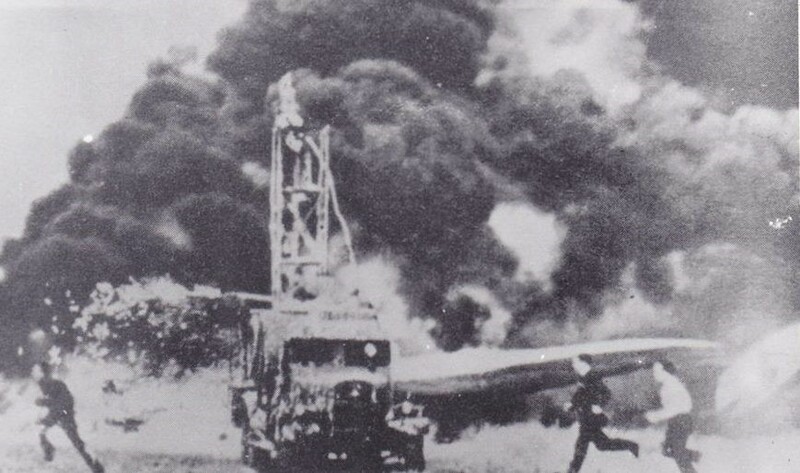 The aircraft, which had been broken in two by the impact, was burning furiously and two members of the crew could be seen alive in the flames below the fuselage. Sergeant Emmett, protected only by asbestos gloves, dashed into the burning wreckage and extricated one of the crew. Before he could return for the second man, the petrol tank split and the fierce heat of the blazing petrol then prevented any near approach. Sergeant Emmett tried repeatedly to extricate the other living member of the crew by means of a grab hook but without success. In spite of a violent explosion, Sergeant Emmett continued to direct the work of his fire party until the fire was completely extinguished and the remaining bodies were recovered. Unfortunately, the rescued airman has since died of his injuries. Sergeant Emmett on this occasion displayed great devotion to duty and courage and disregard for his own safety. He has been in charge of the station firefighting personnel for the past 9 months and has shown considerable fortitude and presence of mind at many flying accidents on and near the station. 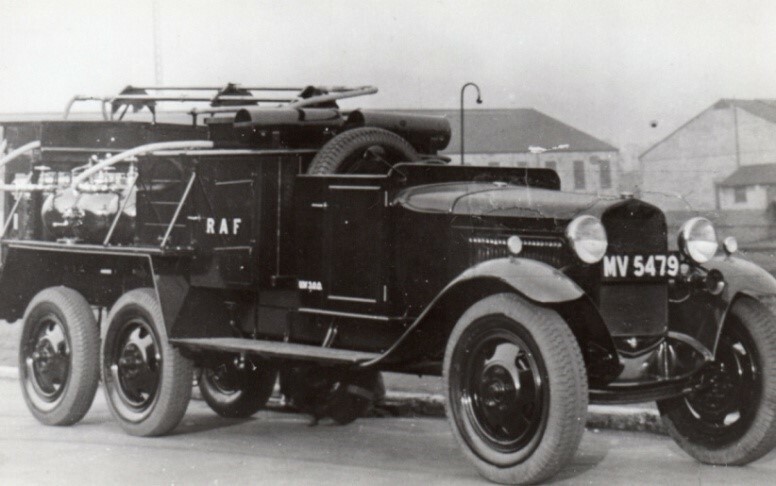 By 1940 the RAF Fire tender stock was mostly comprised of the Crossley FE1, the Streamlined and FWD Type with the introduction of the Ford Motor Company WOT1. 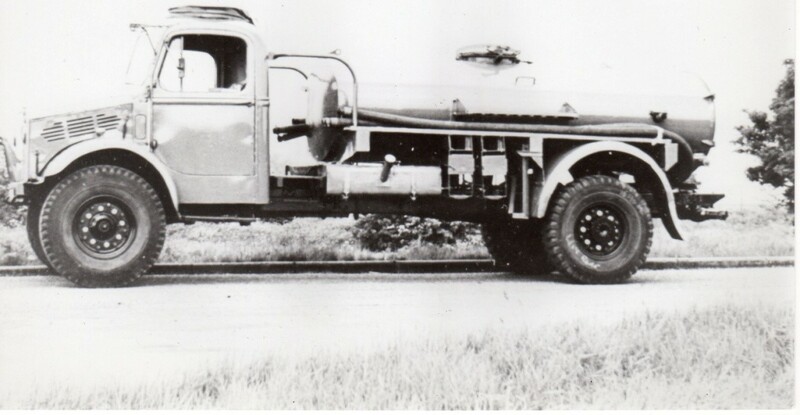 A Crossley FWD Type 4X4 Crash Tender which carried 300 Gallons (1,350 Litres) of Water, (28 Litres) of Foam Compound and 4 60Ib CO2 cylinders. A preserved WOT1 (War Office Truck 1) at the Museum of RAF Firefighting. The later type was modified to carry 400 gallons of water and 65 gallons of foam to increase foam production. Although the WOT1 and Crossley’s were in production there was still a shortage of fire equipment in the mid-war years. It was when the Fire School moved to RAF Weeton that the ‘Weeton Type’ was developed, which was designated WOT1A. 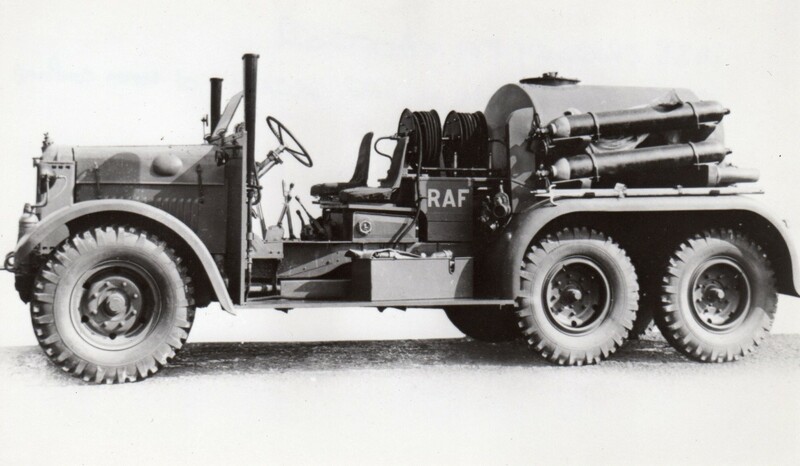 It was on a strengthened chassis with and enclosed cab but the water/compound mixture was fed into the suction side of a standard Coventry Climax light portable pump mounted across the chassis. This increased the quantity of foam produced and a longer jet throw. Some 350 ‘Weeton Type’ Crash Tenders were put into service following their introduction in 1944. The Air Ministry were still concerned that the ability of the current Crash Tenders where not adequate to deal with fires on the large multi engine aircraft. They carried out trials and these proved conclusively that this was the case. The Air Ministry set up a panel to examine and report on the problems. In 1944 the panel concluded that that vehicles capable of producing not less than 2,400 gallons per minute (10,800 litres) for a period of 10 minutes (with additional water supplies) should be made available. Also this should be supported by 1,500Ibs of Carbon Dioxide, but at the time no chassis could carry the quantity of media required. So the recommendations of the panel were met by producing Foam Tenders backed up by Water Tenders and CO2 Tenders. The first of these new Crash Tenders was the “1944 Conversion Type”, so called because it was a conversion of the 1942 WOT1. This carried 300 gallons (1,350 litres) of water and 100 gallons (450 litres) of foam. The main innovation was the provision of three monitors, two on the rear deck and one on the collapsible tower. Two 2½ inch hand lines could also be used at ground level if required. The foam was mixed by a pump which was independent of the road engine. 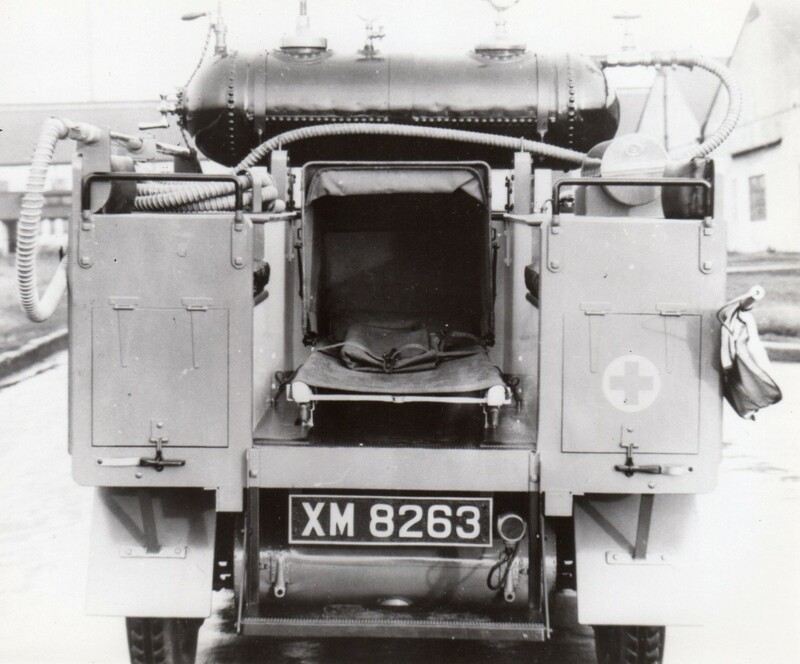 The next Crash tender was the 1944 Monitor Type which was on an extended Ford WOT1A1chassis which allowed a longer crew cab to be fitted to give protection to all personnel. The tower was dispensed with and firefighting was performed by a rear mounted monitor or four hand lines, this was supplemented by four 60 IbCO2. 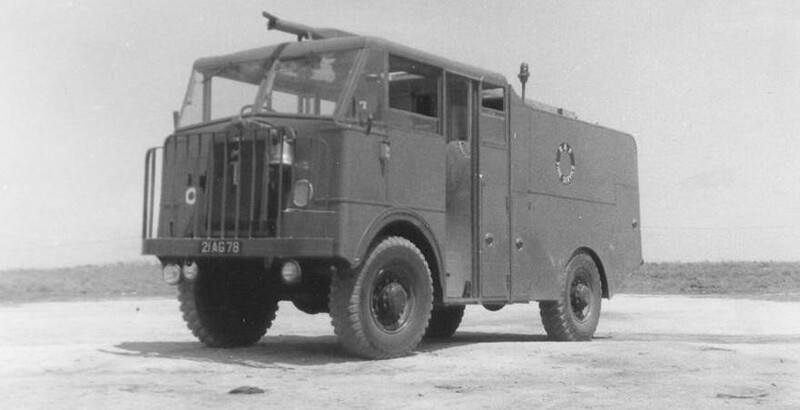 To carry on with the recommendations of the Air Ministry Panel that the foam attack should be supported by a CO2 attack the CO2 Tender was produced and was commonly known as the “Gas Truck” It was based on an Austin K6 6x4 chassis. 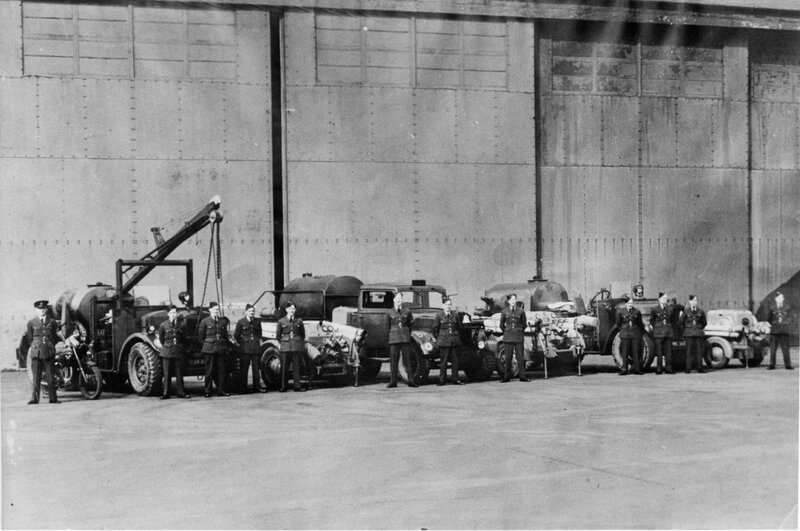 The Co2 (24 x 60Ib cylinders) were installed in four banks of six cylinders each and housed longitudinally on the vehicle chassis, two banks either side, with a catwalk in the centre. The new acquired tenders, the 1944 Conversion, the 1944 Monitor and Gas Truck did not come into service until after the war had ended. 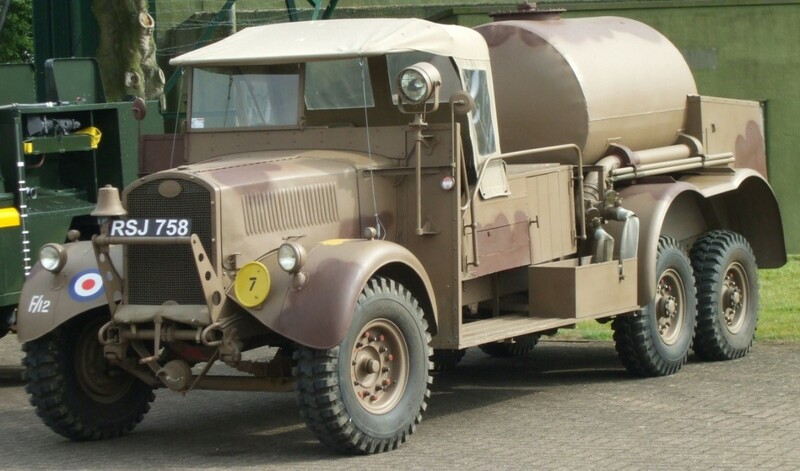 The additional water supplies required were carried on converted water carriers based on Bedford OY or Dodge, Canadian Ford and the Chevrolet 4x2 chassis. The Bedford was the most common. Another development which happened during the War and Post War years was the introduction of an Aircraft Crash Rescue Truck. This was to be a small vehicle which would be fast to the scene of a crash to reduce the time trapped aircrew would be exposed to fire. 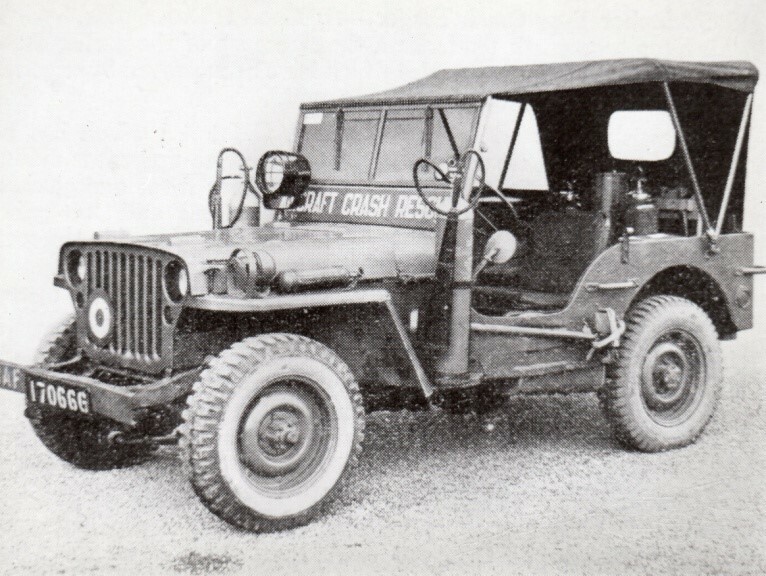 The first which was introduced in 1943 was the Willy’s Jeep which carried four foam extinguishers, two CO2 extinguishers and one CTC extinguisher. It also carried two asbestos blankets, a short ladder, various hand tools, a first aid kit and a searchlight. Other versions over the years were developed most based on a Landrover chassis. 1947 brought and upgrade to the AP 957 (Air Publication) designated as Part 1 for general firefighting guidance and drills. 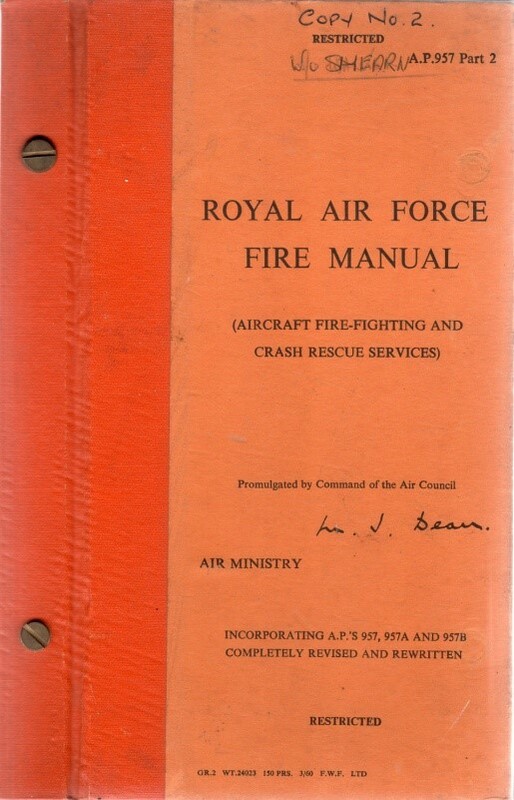 In 1949 The second part was published and was for aircraft fire fighting and crash rescue services. 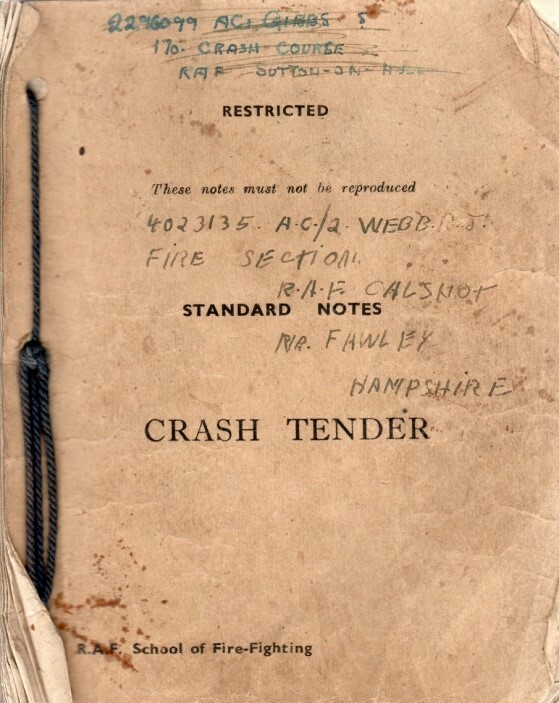 As part of the training package at RAF Sutton-on-Hull recruits were issued with two manuals based on the information in the Air Publications and technical information from the producers of the Crash Trucks. But not all RAF Firemen were trained at RAF Sutton-on-Hull. According to written accounts of Firemen of that era up to about the year 1952, National Service Firemen were sometimes trained on their own unit to which they were posted. After the trade of Fireman was formalised in 1943 in 1949/50 the trade Fireman/Driver was introduced. When in 1951 the trade came under Group 9 they came under Air Traffic Control (ATC) and became Aero Fireman or Aero/Fireman/Driver. 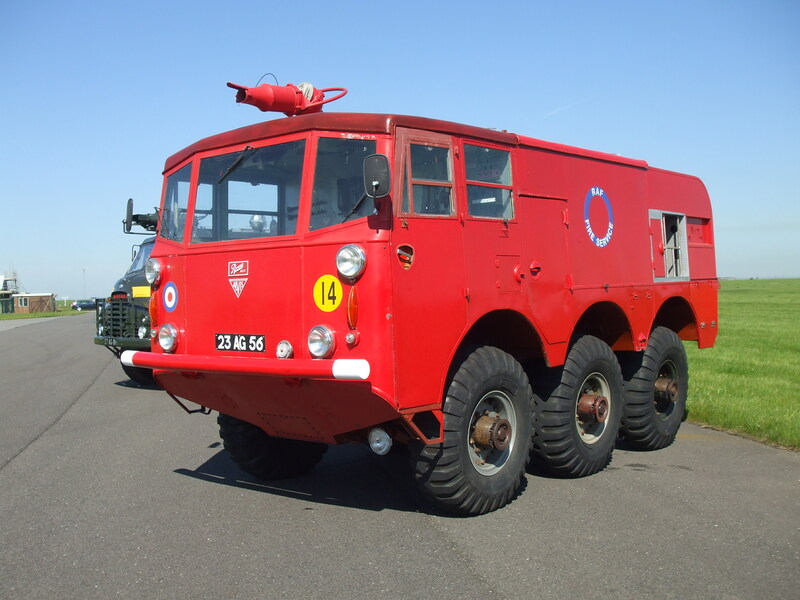 1952 saw the first of the post war vehicles coming into service, this was the Mk5 Crash Tender built by Whitson on a Thorneycroft 4x4 chassis with Sun Engineering fitting the fire equipment. It carried 400 gallons (1,800 litres) of water and 60 gallons (270 litres) of foam, the foam being delivered through hand lines. This also could be used for domestic (structural) firefighting. The Land Rover 86’was introduced, carrying the same basic equipment as the Willy’s Jeep. 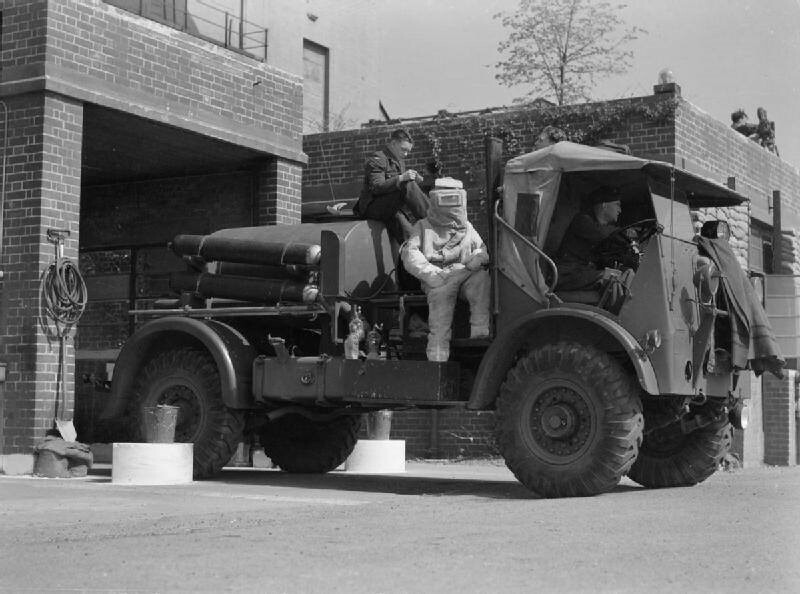 1955 was to see the first Crash Truck in the RAF with a central forward facing monitor. 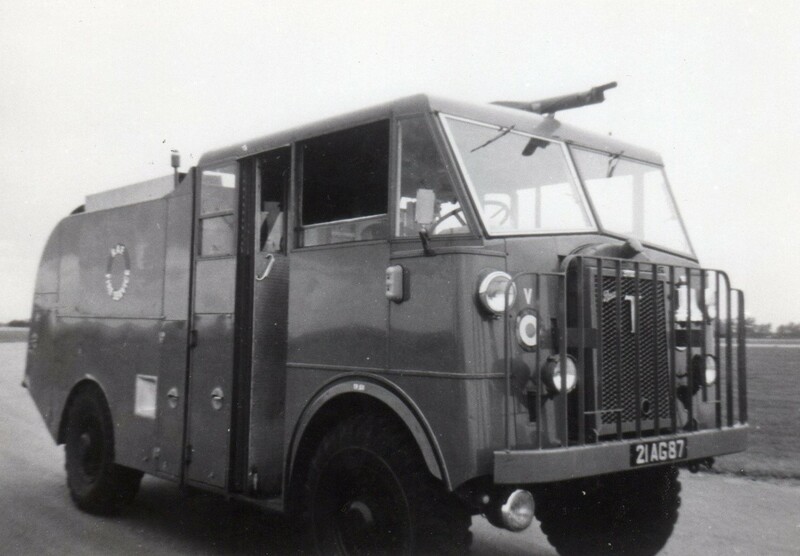 It was designated the Mk5A the body was built by University Motors and fire equipment by Pyrene. The early productions had a different rear body shape. This tender carried 450 gallons (2,025 litres) of water and 60 gallons (270 litres) of foam compound. This also could be used for domestic (structural) fire fighting. 1955 the first of the ‘V Force’ aircraft, the Valiant came into production followed in 1956 by the Vulcan and the Victor in 1958 with such large aircraft carrying large amounts of fuel the need for Crash Trucks which were capable of producing large quantities of foam at a rapid rate needed to be developed. Although the Mk5A was a great leap forward from the War time trucks, continuing development was still required. 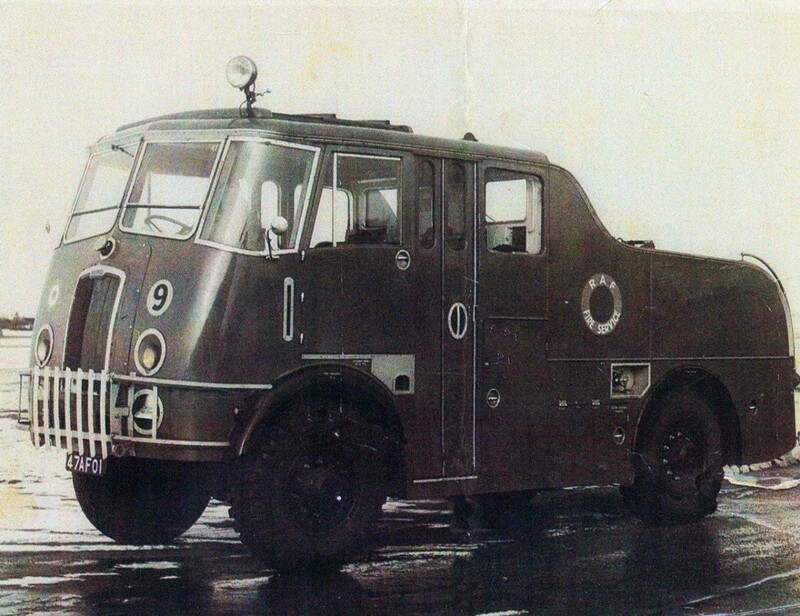 The Next Major Crash Truck finally delivered to the RAF in 1958 was to be the Mk6, a totally different type of vehicle that had never been seen before in the RAF Fire Service. Based on the Alvis Salamander chassis developed from the Alvis Saladin armoured car chassis it was 6x6 giving great off road capability and it could reach 60mph on a flat surface powered by a rear mounted Rolls Royce Mk81A petrol engine using a 5 speed pre-select gearbox. The driver position was in the centre of the cab. 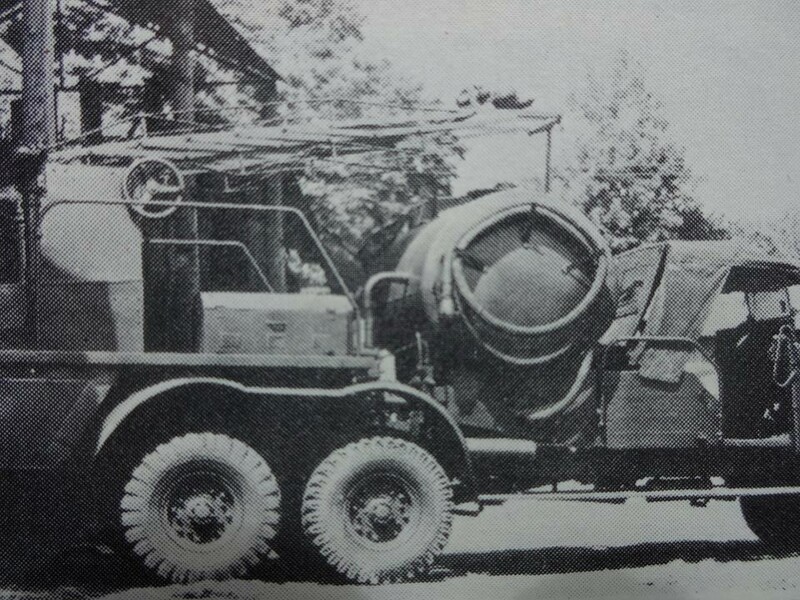 Although the foam producing capacity was about the same as the Mk5A the Mk6 carried 700 gallons (3,000 litres) of water and 100 gallon (450 litres) of foam, plus 10 gallons (42.5 litres) of CBM (Chlorobromomethane) used for secondary fires. It also had an internal fire suppression system for the rear engine compartment. It remained in service until 1978 and had many modifications which brought about variants named Mk6A, 6B, 6C and 6D.